WILMINGTON, N.C. – Most kids like to play, and many adults do too! PlayTime!, Cape Fear Museum’s newest in-house exhibition, opens on March 16, 2018. The exhibit captures a spirit of playfulness in a lively, colorful and highly-interactive space. Visitors are encouraged to play games, build towers, make a work of art and imagine going on an adventure. 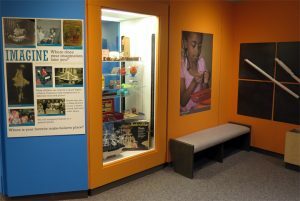 The inviting space also features artifacts drawn from the Museum’s 19th and 20th century toys and games collection. Hundreds of toys and games are on view in PlayTime!, ranging from classics like Lincoln Logs, toy soldiers, an Erector set and a Mr. Potato Head to old favorites such as wooden tops, blocks and dolls. Remember those toys that, for whatever reason, we just had to have? Some of those fad favorites like the Rubik’s cube and 1960s Liddle Kiddle dolls are on exhibit along with toy figures from fast food kids’ meals. Explore toy history in custom label books. Video game consoles have evolved over the years. Before Atari, there was Magnavox Odyssey. See a rare 1970s Odyssey gaming system and its components. Did you know the Odyssey had no sound, and plastic overlays were placed on the TV screen before playing? Discover different types of play through a variety of hands-on activities. Spin a top on a custom-built top table. Whose top will spin the longest? Roll the dice and play an oversized version of a vintage board game, “King of the Turf.” Build a vertical ball run. Let out your inner artist by creating a magnetic mosaic masterpiece. Transform a piece of paper into origami. Dress up and see yourself in a funhouse mirror or act out a skit on stage. While you’re at it, share your photos on social media using the #PlayCFM hashtag. Kids of all ages will enjoy viewing toys from the past, and have fun playing together. PlayTime! will be on exhibit through September 2019.